Let me show you something. And when I say "something", I mean something. See the red arrow, and where it’s pointing? That arrow is pointing to a place that changed humanity forever. You can divide all of history between the time before and the time after what happened where that arrow points. You see, that arrow is pointing to the spot, the very spot, where Neil Armstrong became the first human to step on another world. This image is from the Lunar Reconnaissance Orbiter, and it shows the Apollo 11 landing site. We’ve seen it before, but this time LRO is in its 50 km mapping orbit, so the resolution on this image is far higher — about 50 or so centimeters (20 inches). In this image, the tracks made by Armstrong and Buzz Aldrin as they scampered on the Moon for 2 hours and 31 minutes are obvious. You can even see the lander footpads, each just less than a meter (a bit over a yard) across. 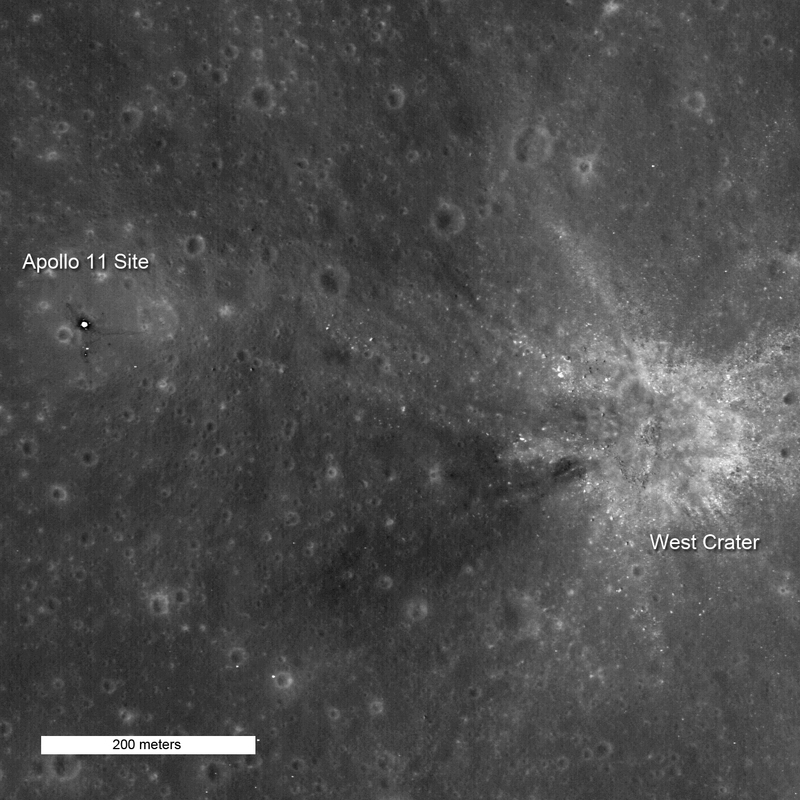 The bright spots south of (below) the lander are various scientific packages they installed, including the Lunar Ranging Retro Reflector and the Passive Seismic Experiment. If I’ve got the scale right, the faint dark trail going to the upper left is where they put the TV camera. Somewhere between that and the lander is the flag. The Sun was shining straight down in this image, so the flag isn’t visible. That big feature to the right is West crater. As the astronauts rode the lunar lander down to the surface, Armstrong saw that the computer was going to put them down right in the rubble field west (left) of the crater. He took control, and with literally seconds of fuel left, put the lander safely down where you see it in this image. His cool hand saved the mission; had they landed among the rubble the lander could have hit a boulder, or landed so lopsided they would not have been able to take off again. Note the picture’s scalebar. If this were the Earth, you could stroll across this image in maybe 10 minutes. Encumbered as they were in their spacesuits, and lacking time, Armstrong and Aldrin never got very far, and certainly not to West crater. Pity; it’s interesting. Look at the rubble around it! Those boulders which almost wiped out our first attempt to land on the Moon must have been excavated by the impact, and would have provided instant insight into the Moon’s deeper layers. Of course, we went back five more times. There was plenty of interplanetary booty to be nabbed. I love these pictures from LRO! I’ve waited for years to be able to see images like this, and they are just as I imagined them. And they come at a propitious time, when the fate of our exploration of space is changing rapidly, and decisions on its future are to be made. It’s at just this time we most need to be reminded of what we can do when we strive for what seems to be impossible, and when we set our sights, quite literally, beyond the horizon.